The late collapse against England and the inability to pick up a four-try bonus point at Murrayfield looks set to cost the champions a realistic chance of a successful title defence, unless Scotland produce a major shock at Twickenham next Saturday. England's favourable points difference means they look beyond Ireland's reach, but all Schmidt's side can do is stop Wales winning the Grand Slam and hope for the best from Scotland. "It would be pretty difficult with the points difference England have and the injuries Scotland have," Schmidt said of the title picture. "Regardless of what may happen in England v Scotland, we just want to finish on a positive note. If we win, we can get second and if we get second considering the way we started and with the number of players we used then we will be pretty happy." Stopping Wales will form no part of Ireland's motivation according to Schmidt, whose players have a day less to prepare than their hosts. "It's funny, people might talk about that but it's just for us really, we want to finish as well as we can in the Six Nations," he said. "It's less about where Wales are positioned. We know that if we could get a win we would go past them in the Championship on the ladder at the end of the day, but at the same time it is just another game. "And as boring as it is, in terms of a six-day turnaround you can't really think too much about Championships or anything else. "We just need to turn our attention to Wales and we'll do that tomorrow evening when we get back together in camp, and then whether we train on Tuesday or Wednesday this week. We'll probably train on Thursday morning before we fly to Wales and then we've got to be ready. "So it's a very, very truncated week for us. It's a very short preparation so it will be a lot less about Wales than it will be about us just trying to get ourselves organised and ready to go." 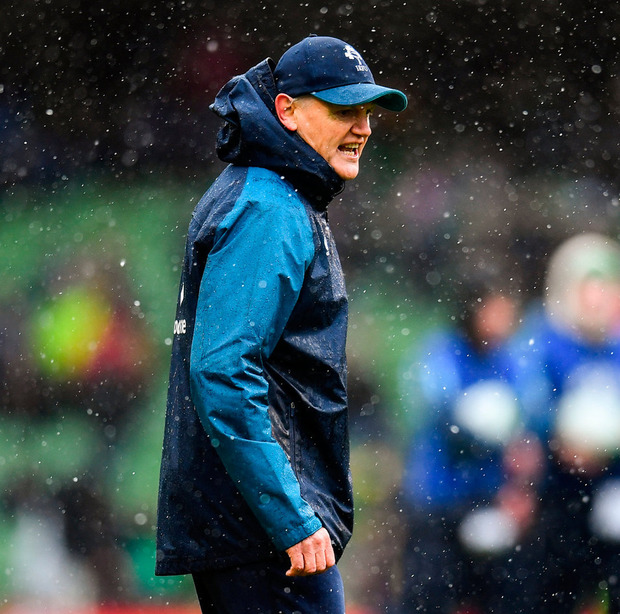 There is scope for changes, but the nature of yesterday's win meant he was able to wrap Johnny Sexton, Conor Murray, Rory Best, Cian Healy, Tadhg Furlong and Iain Henderson in cotton wool well before the end. Rob Kearney should be fit after withdrawing late with a calf issue, while the coach was upbeat about Josh van der Flier's chances after he went off after 25 minutes. Schmidt said "he got twisted a bit awkwardly" and couldn't continue. Schmidt name-checked Dan Leavy and Sean O'Brien as potential options, while Sean Cronin also got a mention as someone who could come in and provide some freshness this week. Robbie Henshaw was effectively ruled out of the equation. "There's a couple of guys who have been in and around the squad. Obviously Dan Leavy was up in Belfast, Rob Kearney should be right to train on Tuesday. Sean O'Brien, Sean Cronin, Rob Herring, there's a number of guys who we'll get back this evening and go through and have a look at how they all shape up," Schmidt said. "There's obviously a few guys in the backs as well but the midfield combination worked well today with Bundee (Aki) and Garry Ringrose, those guys have played together a fair bit. "The back three, certainly the wingers have been one of the more consistent fixtures so far in the Six Nations. "Andrew Conway came in late, but whether we have a look at freshening that up… and front-row wise, Andrew Porter was with us in the warm-up. "Tadhg Beirne, we'll see how he is on Tuesday, there's those sorts of options that we'll just have a look at."